Whew, life has been hectic lately, y’all! But it’s a good hectic. In addition to launching the new Budget Bytes app (p.s. the Android app is officially coming! ), I’m in the process of selling my home in New Orleans and relocating to Nashville. So yeah, my days have been CRA-ZY. But I still need to eat! So just before I left for my 8 hour drive to Nashville the other day I made these super fast, easy, and deliciously smoky Roasted Corn Quesadillas. The star of these quesadillas is this amazing frozen roasted corn that I got at Trader Joes. I’m beginning to see similar products pop up other places too, like Whole Foods. The corn is charred before it’s frozen and it has the most incredible smoky flavor. It’s kind of like fire roasted canned tomatoes versus plain canned tomatoes, except times ten. It’s seriously a game-changing ingredient. 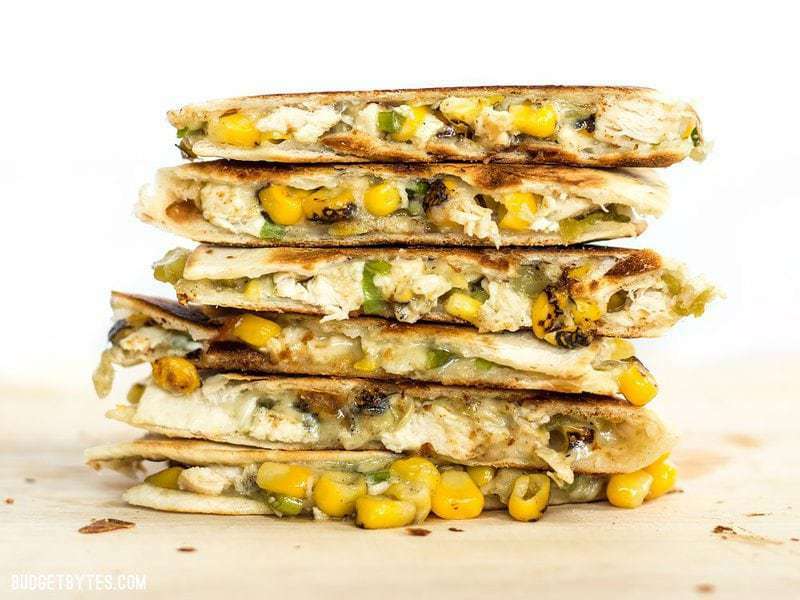 If you can’t find the frozen fire roasted corn I think these quesadillas would still be quite good. You can experiment with blistering the corn in a cast iron skillet like I did for my Warm Corn and Avocado Salad, although it doesn’t quite impart the level of smokiness as the store bought fire roasted corn. 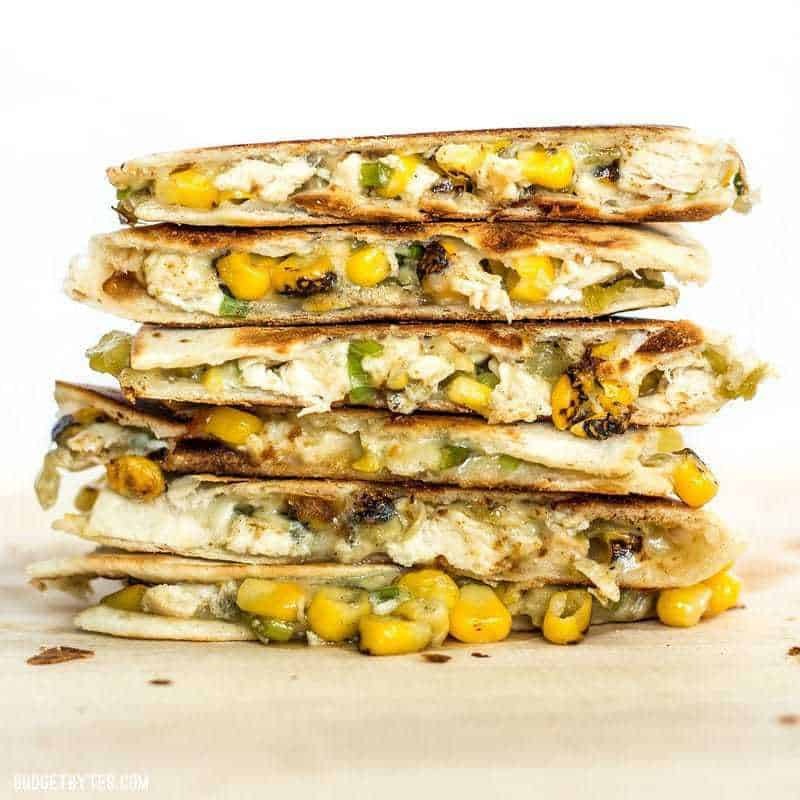 These smoky Roasted Corn Quesadillas are a fast and filling lunch that can be kept in the freezer for a fast meal or snack. 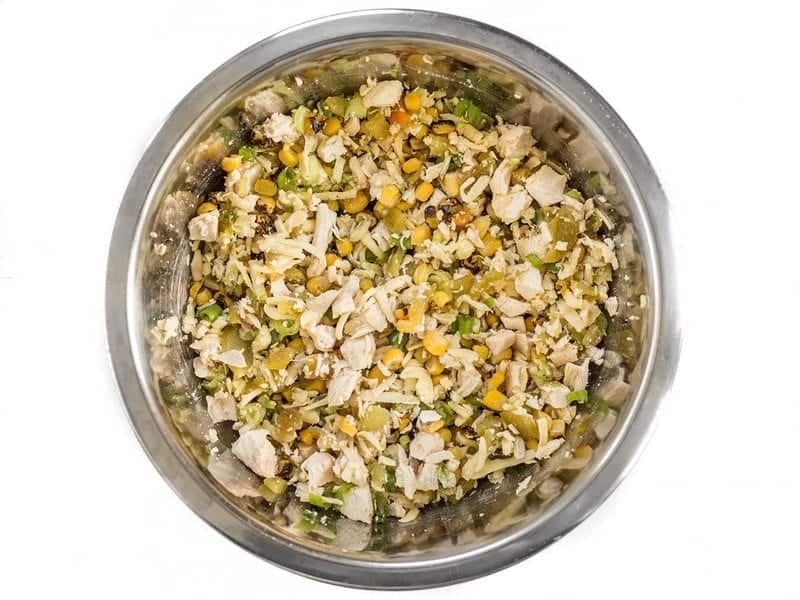 Combine the chopped chicken, corn kernels (no need to thaw first), sliced green onions, diced green chiles, shredded cheese, cumin, and salt in a bowl. Stir until everything is evenly combined. Place 1/2 cup of the chicken and corn mixture in each tortilla, spreading it over 1/2 of the surface, then folding the tortilla to close. Repeat until you run out of filling (I filled 7 tortillas before running out). Place the quesadillas in a dry skillet over medium-low heat. Cook on each side until the tortillas are brown and crispy and the filling is melted and gooey. 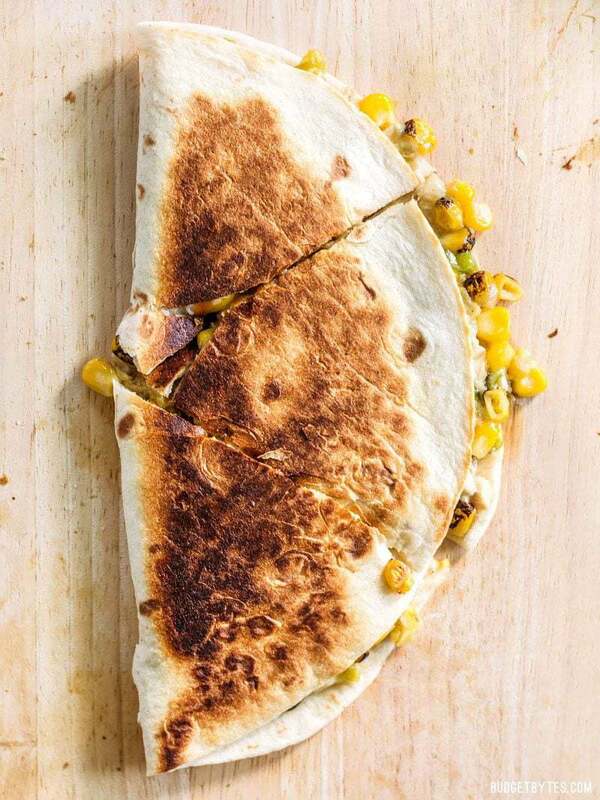 Cut each quesadilla into thirds and serve. *I used one side of the breast from a rotisserie chicken, but you could quickly cook a boneless, skinless chicken breast or thighs in a skillet, then chop it. **I used a Mexican cheese that I found at the grocery store, but it tasted exactly like Monterey Jack and that is what I would suggest in lieu of Mexican cheese. 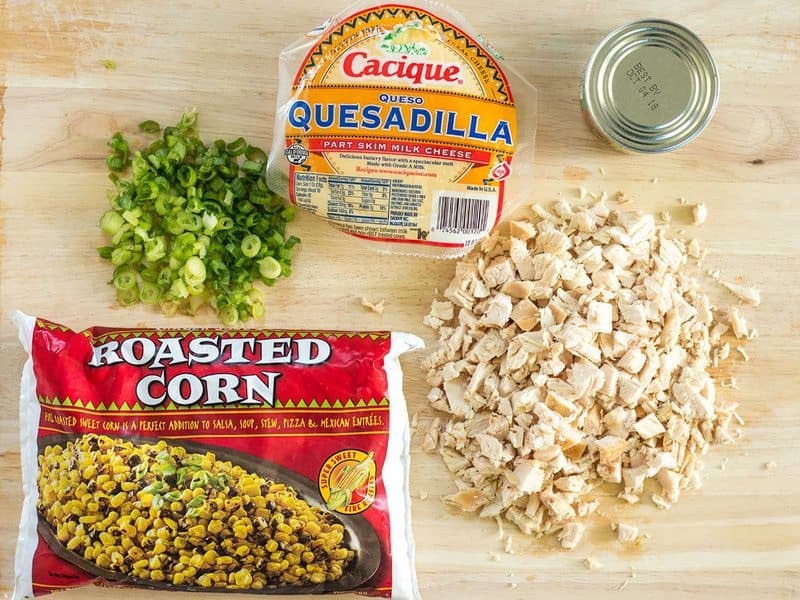 Place the green onions, cheese, green chiles, chicken, and corn in a bowl, along with 1/4 tsp cumin and 1/4 tsp salt. Stir until everything is evenly combined. 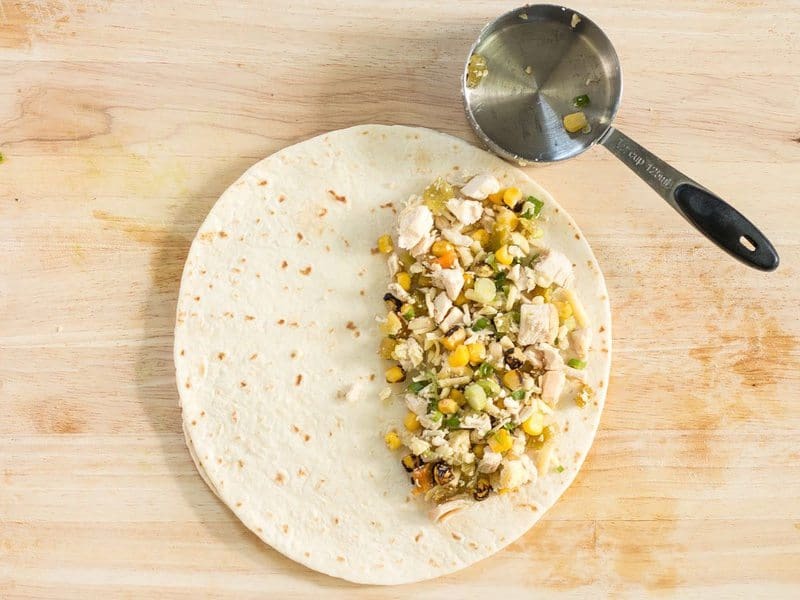 Place about 1/2 cup of the corn and chicken filling in each 8-inch tortilla, spread it over half of the surface, then fold the tortilla to close. I was able to fill seven tortillas before I ran out of filling. To cook the quesadillas, place them in a dry skillet over medium-low heat. Cook on each side until the tortillas are brown and crispy and the filling is melted and gooey. Slice into thirds and serve! Easy and fast! 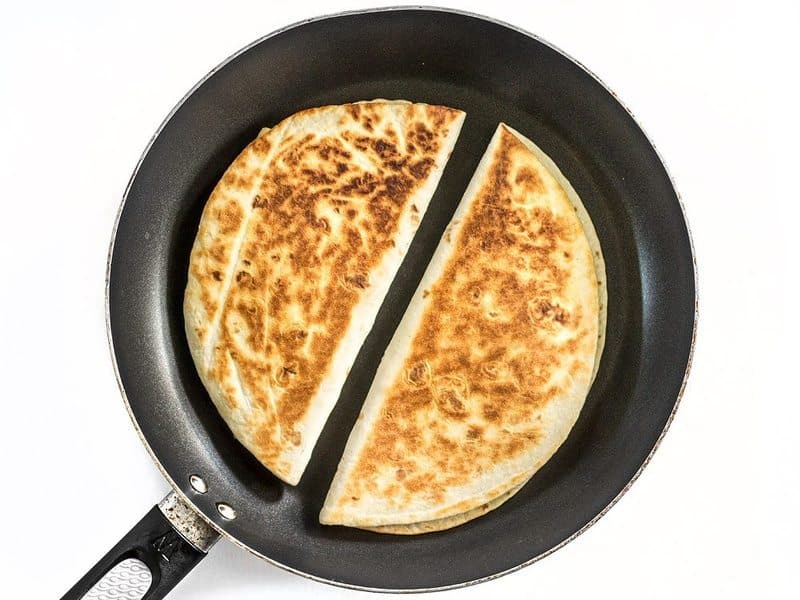 If you want to freeze your quesadillas for later, just fill and fold, but do not cook in the skillet before freezing. Stack the uncooked quesadillas with a layer of parchment paper between each, place them in a gallon-size freezer bag, and pop them in the freezer. To cook from frozen, let thaw at room temperature for about 15 minutes, then cook over low heat until crispy on the outside and melted on the side. Make sure not to use higher heat or the inside will likely not heat through before the tortilla browns. This is my second recipe I have made from BB. Very good! I added cilantro and served with refried beans and salsa, So good! And really great for local sweet corn that is coming on. Phenomenal recipe! Made it for lunch and will have plenty of leftovers for the week. This was great-even though I forgot to roast the corn first. All 4 of my kiddos enjoyed it-and that is RARE!! Also, it truly made 7 tortillas. Definitely making this again! Thanks so much! These were so awesome. I didn’t have green chilies so I used extra cilantro for flavor, and I used leftover shredded chicken. I put these together tonight. I increased the batch because I had extra chicken. For the corn, I just used regular frozen corn but broiled it for around 5 minutes. I also added some black beans. These were very tasty and I’m going to try freezing the leftovers without cooking them first. These were so good. I love that this recipe calls for less cheese than what I usually use when making quesadillas. Thanks for posting this, I will be making this again soon! Love these. I had some tortillas to use up one night and i made these and we loved them. Tonight I’m going to make the filling but put it over some yellow rice instead of using the tortillas. Thanks! Made a tweaked version of this today and it was tasty! Subbed regular corn and added cilantro instead of green onions. It was super easy & quick and I’ll be making this a lot more. Maybe next time I’ll add beans or some other fun combo. Thanks! Made today with no tweaks to recipe and served with avocado and sour cream. Delish! Froze the leftovers. Just made these for dinner, so yummy! Love the pop of sweetness from the corn. Your Pinterest page says roased corn, as an FYI and you website is giving me issues on mobile. I know you have an iPhone app now but is there a mobile friendly site for us android losers? Can you tell me what issues you are having with the mobile site so I can try to trouble shoot it? Delicious and easy! I used pinto beans instead of chicken since I did my shopping at TJ’s this week and regrettably they don’t sell rotisseries and I am too lazy to cook my own. I also used corn tortillas instead of flour since I prefer them. This will definitely be a staple, thank you! Made this for diner and it was very good. Will be adding it to the menu list. Also too some of the unused filling heated it up with two eggs this morning for a nice flavored scrambled eggs. Please continue to add instructions on the best way to save leftovers and reheat them / save them for later. I find these instructions really helpful as a college student because you are just making meals for yourself and not a family of four. I haven’t tried this recipe but I will have to make it! SO FREAKIN’ GOOD! I made the vegetarian version since I had a can of white beans to use up. This was my first time tying TJ’s roasted corn, but not my last. I’ll try it in Beth’s Roasted Corn Salad next, which is another Budget Bytes favorite. « Previous PostThe Budget Bytes App is Here!